If you are in the business of rotating equipment, this would be of interest to you. I receive an update from my online subscription of HydroWorld magazine and I thought I'd share this with you. 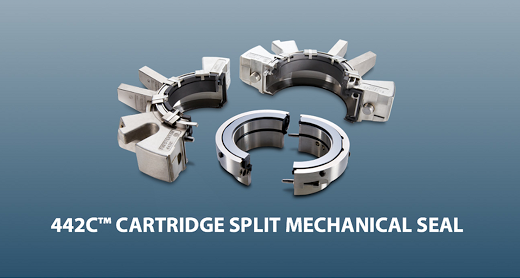 Many of the mechanical seals in our application are brand specific, i.e. seals that are specified by the pump manufacturer, but this could prove to be an excellent alternative if it stand up to the pressure in our system. This is essentially a cartridge mech seal but with the benefit of much faster installation and better pressure handling, as claimed by seal specialist Chesterton. If your main concern is downtime then this could be your answer as the manufacturer claims you can install it in just a matter of minutes. Similar to ammeter clamps for busbar in electrical panels which require lengthy shutdown, solid round mechanical seals are a nightmare to install especially on critical equipment. Ammeter clamps have came a long way in inventing split clamps, although accuracy would be slightly affected. But for non-billing applications, split clamps are more than sufficient. I would think that split mechanical seals would serve the same purpose. Sealing capability would inprove with every introduction of 'facelift' for the existing model/platform. The 442C uses an interlocking face design with a unique holder that self-aligns the face halves in the rotating assembly. This ensures proper face alignment, which is critical to sealing success. Springs energize after installation, allowing for maximum space between seal faces during installation. The seals have been used on pumps and other rotating equipment with shaft sizes ranging from one inch to 30 inches. The design simplifies installation and repair by using a standard spare parts kit, allowing the user to lower inventory costs, enhance operation flexibility and speed up equipment turnaround. There is an Android App for you to see it in action which you can download here. Details can be obtained at PumpnSeal and Chesterton brochure.